Being a bit of a numbers nerd (ya think?!? 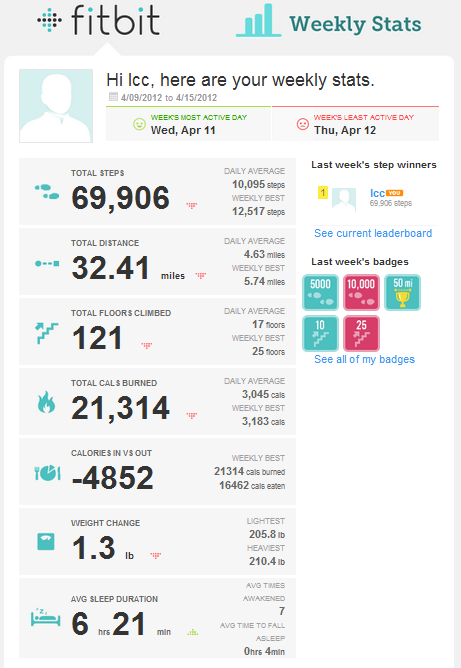 ), I find the emails sent by Fitbit kinda cool. Thought you might like a look. I am actually impressed with its accuracy. I’ve counted my steps a few times and compared it to the device and it is very, very close. It also seems to count going up stairs, but NOT going up escalators – clever. The weight numbers here might be a bit misleading because I haven’t been entering them in here with any regularity. I also question the accuracy of the sleep stats, as it’s easy to mess up – you’re supposed to essentially tell the thing you are falling asleep, but, like most people, this sometimes sneaks up on you if you’re reading in bed. I also have forgotten to put it on completely. Previous Post Is This Pro-Atkins Article Too Good To Be True?